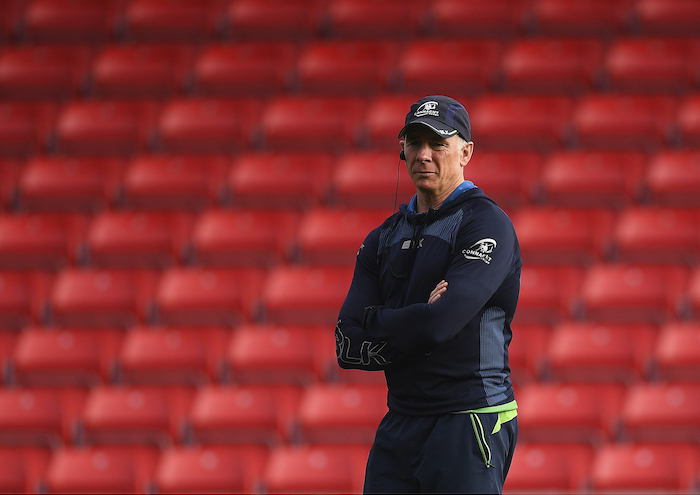 Looking to get back to winning ways: Connacht head coach Andy Friend is looking for Connacht to get back to winning ways this weekend. Photo: Sportsfile. Connacht's heavy hitters are expected to return this week for a pivotal Pro14 fixture against Ospreys in Wales. Described as a "season shaper" by Connacht's backs coach, Nigel Carolan, this fixture between these Conference A rivals could propel Andy Friend's men into the top four if they can overcome the Welsh outfit tomorrow evening in Bridgend (8.05pm ). With little between the teams on current standings, Ospreys are currently second behind Glasgow with 18 points. But with Ospreys, Cardiff, Munster and Connacht all within three points of each other, this is the ideal time for Connacht to secure a second successive away victory to push them closer to the top. This week's team selection will reflect the importance of this fixture, and expect to see captain and top tackler Jarrad Butler, outhalf Jack Carty, and internationals Quinn Roux, Bundee Aki, Finlay Bealham, and Kieran Marmion involved, having been rested last weekend. And certainly Connacht will need to capitalise on their availablility now with all four once again named in Joe Schmidt's squad for the Autumn Internationals. "We are going with a fresh squad, having rested a lot of guys last week," says Carolan, "and during that time we have developed the strength in depth of the squad." Last week's team and this week's selection were based on a number of factors - not least the importance of closing the gap on the leaders in the Pro14 table "Looking at players' minutes, the guys needed a break," says Carolan, "while we also needed to build some depth in the squad, and it was with that in mind and with this game in mind - it is a very important game in how the season could unfold." Kieran Marmion has returned to full training after injurying his ankle against Ulster. "It's good to have him back. In fairness to Caolan Blade, he's been awesome for us - his passing and general leadership has created great competition." However the news is not so good for Craig Ronaldson, who has been ruled out for most of the season following knee surgery, while youngster Conor McKeon returnd to the Sportsground yesterday after shoulder surgery in Dublin. Gavin Thornbury is "slowly making his way back" and is expected to resume training in a couple of weeks, as is No 8 Eoin McKeon and Eoghan Masterson. Matt Healy's recovery from a "boney bruise" foot injury has been slow and he is expected to need at least another week. Ronaldson, who resumed playing outhalf after a couple of seasons in the centre, was "very important for the first part of the season and still is", says Carolan. "He's busy working every weekend, and now in terms of looking at Ospreys. He's a very good coaching assistant, has a tactical brain, and is a great asset to me - looking at the opposition, little trends - and are trying to utilise his skills as much as possible now he has been sidelined," says Carolan. As a result of Swansea City hosting Reading in Liberty Stadium, Connacht head to Brewery Field Bridgend. Loaded with internationals, both backs and forwards, they have always been formidable opponents. The last occasion Connacht won in Swansea was in 2015/16. Inspired by Bundee Aki, Connacht won 16-21 - their first since 2004 - and of course it helped pave the way for Connacht's historic Pro12 trophy win. Carolan is also hoping the change in venue from Liberty Stadium will play into Connacht's hands, saying, "the fact that it's in Bridgend takes away the home advantage they would have had in Swansea". However Carolan, who was assistant to Allen Clarke in the Ireland U21 set-up for two years, credits the Ospreys' coach with having "steadied the ship" in Swansea. "They are playing with a real sense of pride in their region. He [Clarke] has brought in some really positive coaching resources, and they are playing really good rugby, getting the results, and taking some scalps. We have to make sure we are not one of them this week. "This particular game against the Ospreys is a season shaper. These games in the Conference are so important from the point of view of winning. When you win you are denying them acesss up the ladder as well, and that is why it is really important we go over there fully focused on taking maximum points if we can and deny them as much as possible. All these points count at the end of the season in four conference." "We play a similar style, high tempo, physical, high intensity, and they have a lot of international players. We are not sure about their arrangements for the Autumn Internationals, but we are over there expecting them to be fully loaded and that is how we are preparing. "The biggest is the way they hold you up in the tackle and try to slow down your breakdown, so we have make sure we get fast ball and we take the opportunities of everything we create."